Charles Augustin Coulomb's father was Henry Coulomb and his mother was Catherine Bajet. Both his parents came from families which were well known in their fields. His father's family were important in the legal profession and in the administration of the Languedoc region of France, and his mother's family were also quite wealthy. After being brought up in Angoulême, the capital of Angoumois in southwestern France, Coulomb's family moved to Paris. In Paris he entered the Collège Mazarin, where he received a good classical grounding in language, literature, and philosophy, and he received the best available teaching in mathematics, astronomy, chemistry and botany. At this stage in his education there was a crisis for Coulomb. Despite his father's good standing, he had made unsuccessful financial speculations, had lost all his money and moved from Paris to Montpellier. Coulomb's mother remained in Paris but Coulomb had a disagreement with her over the direction his career should take so he left Paris and went to Montpellier to live with his father. At this stage Coulomb's interests were mainly in mathematics and astronomy and while in Montpellier he joined the Society of Sciences there in March 1757 and read several papers on these topics to the Society. Coulomb wanted to enter the École du Génie at Mézières but realised that to succeed in passing the entrance examinations he needed to be tutored. In October 1758 he went to Paris to receive the tutoring necessary to take the examinations. Camus had been appointed as examiner for artillery schools in 1755 and it was his Cours de mathématiques Ⓣ that Coulomb studied for several months. In 1758 Coulomb took the examinations set by Camus which he passed and he entered the École du Génie at Mézières in February 1760. He formed a number of important friendships around this time which were important in his later scientific work, one with Bossut who was his teacher at Mézières and the other with Borda. 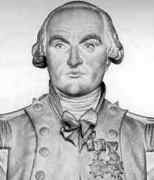 Coulomb graduated in November 1761. He was now a trained engineer with the rank of lieutenant in the Corps du Génie. Over the next twenty years he was posted to a variety of different places where he was involved in engineering, in structural design, fortifications, soil mechanics, and many other areas. His first posting was to Brest but in February 1764 he was set to Martinique in the West Indies. Martinique fell under the sovereignty of France under Louis XIV in 1658. However Martinique was attacked by a number of foreign fleets over the following years. The Dutch attacked it in 1674 but were driven off, as were the English in 1693 and the English again in 1759. Martinique was finally captured by the English in 1762 but were returned to France under the terms of the Treaty of Paris in 1763. The French then made attempts to make the island more secure by building a new fort. Coulomb was put in charge of the building of the new Fort Bourbon and this task occupied him until June 1772. It was a period during which he showed the practical side of his engineering skills which were needed to organise the construction, but his experiences would play a major role in the later theoretical memoirs he wrote on mechanics. As far as Coulomb's health was concerned these were difficult years and the illnesses which he suffered while on Martinique left him in poor health for the rest of his life. ... to determine, as far as a combination of mathematics and physics will permit, the influence of friction and cohesion in some problems of statics. In this one memoir of 1773 there is almost an embarrassment of riches, for Coulomb proceeded to discuss the theory of comprehensive rupture of masonry piers, the design of vaulted arches, and the theory of earth pressure. In the latter he developed a generalised sliding wedge theory of soil mechanics that remains in use today in basic engineering practice. A reason, perhaps, for the relative neglect of this portion of Coulomb's work was that he sought to demonstrate the use of variational calculus in formulating methods of approach to fundamental problems in structural mechanics rather than to give numerical solutions to specific problems. It is often the case that a sophisticated use of mathematics in an application to an area where most have less mathematical sophistication, gives the work a long term values which is not often seen at the time. The memoir was certainly highly valued by the Académie des Sciences for it led to him being named as Bossut's correspondent on 6 July 1774. From Bouchain, Coulomb was next posted to Cherbourg. While he was there he wrote a famous memoir on the magnetic compass which he submitted for the Grand Prix of the Académie des Sciences in 1777. ... his simple, elegant solution to the problem of torsion in cylinders and his use of the torsion balance in physical applications were important to numerous physicists in succeeding years. ... Coulomb developed a theory of torsion in thin silk and hair threads. Here he was the first to show how the torsion suspension could provide physicists with a method of accurately measuring extremely small forces. Another interesting episode occurred during the time which Coulomb spent at Cherbourg. Robert-Jacques Turgot was appointed comptroller general by Louis XVI on 24 August 1774. He began to feel threatened by his political opponents in 1775 and began a series of reforms. Among these was the reform of the Corps du Génie and Turgot called for memoirs on its possible reorganisation. Coulomb submitted a memoir giving his ideas and it is a fascinating opportunity to understand his political views. Coulomb wanted the state and the individual to play equal roles. He proposed that the Corps du Génie in particular, and all public service in general, should recognise the talents of its individual members in promotion within the organisation. Viewing fortresses as nothing more than immense permanent batteries designed to pour overwhelming fire on attacking armies, Montalembert simplified the intricate geometric designs of Vauban and relied on simple polygonal structures, often with detached peripheral forts instead of projecting bastions. ... investigated both static and dynamic friction of sliding surfaces and friction in bending of cords and in rolling. From examination of many physical parameters, he developed a series of two-term equations, the first term a constant and the second term varying with time, normal force, velocity, or other parameters. Coulomb's contributions to the science of friction were exceptionally great. Without exaggeration, one can say that he created this science. ... had obtained some remarkable results by using the torsion balance method: law of attraction and repulsion, the electric point charges, magnetic poles, distribution of electricity on the surface of charged bodies and others. The importance of Coulomb's law for the development of electromagnetism is examined and discussed. In these he developed a theory of attraction and repulsion between bodies of the same and opposite electrical charge. He demonstrated an inverse square law for such forces and went on to examine perfect conductors and dielectrics. He suggested that there was no perfect dielectric, proposing that every substance has a limit above which it will conduct electricity. These fundamental papers put forward the case for action at a distance between electrical charges in a similar way as Newton's theory of gravitation was based on action at a distance between masses. These papers on electricity and magnetism, although the most important of Coulomb's work over this period, were only a small part of the work he undertook. He presented twenty-five memoirs to the Académie des Sciences between 1781 and 1806. Coulomb worked closely with Bossut, Borda, de Prony, and Laplace over this period. Remarkably he participated in the work of 310 committees of the Academy. He still was involved with engineering projects as a consultant, the most dramatic of which was his report on canal and harbour improvements in Brittany in 1783-84. He had been pressed into this task against his better judgement and he ended up taking the blame when criticisms were made and he spent a week in prison in November 1783. He also undertook services for the respective French governments in such varied fields as education and reform of hospitals. In 1787 he made a trip to England to report on the conditions in the hospitals of London. In July 1784 he was appointed to look after the royal fountains and took charge of a large part of the water supply of Paris. On 26 February 1790 Coulomb's first son was born, although he was not married to Louise Françoise LeProust Desormeaux who was the mother of his son. When the French Revolution began in 1789 Coulomb had been deeply involved with his scientific work. Many institutions were reorganised, not all to Coulomb's liking, and he retired from the Corps du Génie in 1791. At about the same time that the Académie des Sciences was abolished in August 1783, he was removed from his role in charge of the water supply and, in December 1793, the weights and measures committee on which he was serving was also disbanded. Coulomb and Borda retired to the country to do scientific research in a house he owned near Blois. The Académie des Sciences was replaced by the Institut de France and Coulomb returned to Paris when he was elected to the Institute in December 1795. On 30 July 1797 his second son was born and, in 1802, he married Louise Françoise LeProust Desormeaux, the mother of his two sons. We mentioned above that Coulomb was involved with services to education. These were largely between 1802 and 1806 when he was inspector general of public instruction and, in that role, he was mainly responsible for setting up the lycées across France. It is to Borda and to Coulomb that one owes the renaissance of true physics in France, not a verbose and hypothetical physics, but that ingenious and exact physics which observes and compares all with rigour.